Alistair Burt writes ahead of World Autism Awareness Day about Liverpool's great initiative and the the government's commitment to those living with autism. Plus: Read the Liverpool Echo piece about this - Five reasons why Liverpool deserves to be named UK’s first autism-friendly city - with comments from Alistair Burt. That’s a shocking statistic to consider - especially for those of us committed to closer integration of health, care and community services as we seek to promote and protect the wellbeing of us all. Tomorrow is World Autism Awareness Day – but before that something equally special is happening in your city today. With the help of the hugely dedicated and influential charity Autism Together and local community business Autism Adventure UK Liverpool officially announces its intention to become the country’s first Autism Friendly City. But what does that actually mean? At the most basic human level, it means a commitment to treating those living with autism, Asperger’s and other cognitive conditions in exactly the same way as anyone else. Autism is not a person’s defining characteristic, nor should it define how they are treated. However, the nature and provision of attitudes, services and facilities can mean the difference between ambition thwarted and opportunity fulfilled. Robin Bush, Chief Executive of Autism Together, puts it better than me when talking about what an autism friendly Liverpool might look like: “We believe an autism friendly city should enable those with autism to confidently access community infrastructures such as shopping centres, tourist attractions and public transport.” There is much more to it than that of course, but the point is clear – people with autism deserve the same access and opportunity as anyone else. 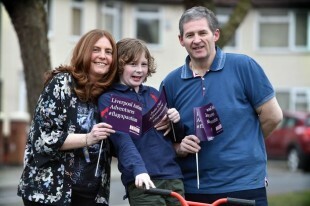 Liverpool isn’t the only hub of awareness raising activity: the National Autistic Society is also using the day to launch its Too Much Information (TMI) campaign. This is not some initiative to prevent ‘over-sharing’ but a way to highlight the difficulties autistic people face when trying to process lots of information or stimuli. Bright lights, loud noises or changes to routine can be unsettling for many of us – but so much more debilitating for those living on the spectrum and made worse by the ignorance or insensitivity of others. I will be showing my support for the TMI campaign over the coming weeks and months and I hope many others will too. Visit the National Autistic Society website and why not make your pledge to understand autism better? Of course, beyond these initiatives, autistic people, their families and carers need good access to health, social care and other public services and our work to issue new statutory guidance for local authorities and the NHS will help to improve that. More broadly, I’d encourage those with caring responsibilities to take part in our call for evidence in support of a new strategy for carers - a public engagement exercise we’re running with close involvement of Carers UK and the Carers Trust. We’ve also been working with Autism Alliance UK, the largest network of specialist autism charities, on the Connect to Autism project, which the Department of Health is funding, and is co-ordinated by the North East Autism Society. It encourages local organisations to become Autism Champions by making public commitments to train staff in autism awareness. Local libraries, museums, health centres, football clubs and health centres have all signed up and I hope this template will be replicated across the UK. Back to today’s announcement which takes place in Liverpool’s Chamber of Commerce. It brings together an impressive cast list of heavyweight businesses including Mersey Travel, Liverpool Jon Lennon Airport, National Museums, Everton FC and representatives from retail, hotel and leisure. Their collective willingness to make changes is inspiring and I wish them and the people of Liverpool every success now and in the future. This is yet another reason for Liverpool to be very proud of itself and its community spirit. Regardless of how many companies, charities or cities commit to being autism friendly, wider public understanding is crucial. On that point, I’ll leave you to ponder this moving thought from Julie Simpson, founder of Autism Adventure UK and one of the driving forces behind the Liverpool campaign: “I wouldn't change my son for the world but I will change the world for my son."